USDCAD defines close levels ahead of the BOC decision. 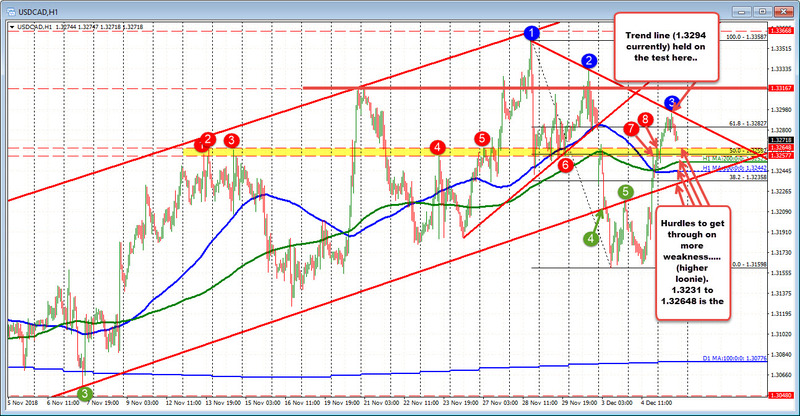 The BOC decision is in a few minutes and that means the USDCAD can move around depending on the bias. Technically, the pair has been moving up and down in the near term which gives traders a lot of levels to get through on the topside or downside. What trader hope is a break and run because of some definitive bias. ON the topside a trend line stalled the rally today. The market is near that level going into the decision. A move above would look toward the recent swing highs with 1.33167 the next target followed by Friday's and last week's highs. On the downside, the 1.32648 to 1.3231 has a number of technical levels including the 50%, the 100 and 200 hour MA and a trend line going back to the low from October 16 (not shown). Then again, it could waffle in the current area.